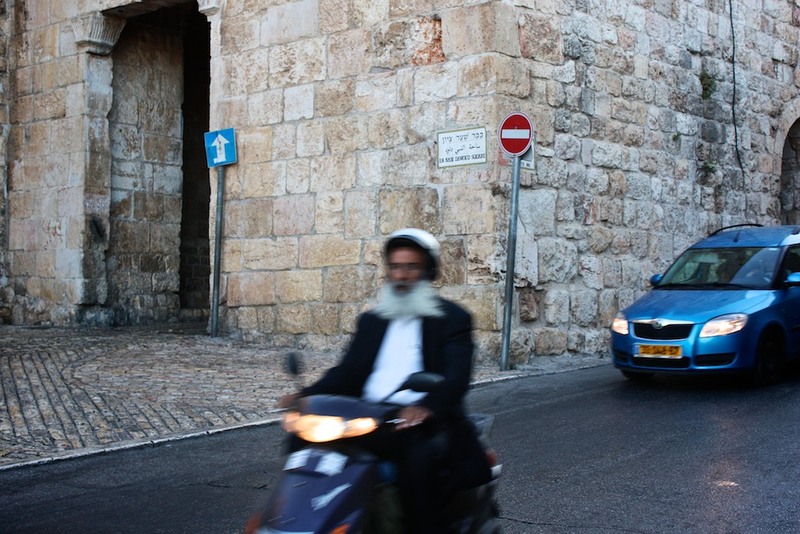 “The flying Rabbi” (© Michel Botman Photography, Jerusalem 2009). I had asked him why religious laws that seemed to be so central, so immutable and so absolute, were in fact applied so entirely differently, not only from one Jewish community to the next (Conservative, Orthodox, Reform, etc. ), but also over time within the entire Jewish tribe by and large? I had specifically asked my friend why lapidation, for instance, was no longer practiced, since it appeared to have been such an essential law? The Rabbi, who had just started to read his sefer, replied to the total stranger, “What would you want to talk about?” “Oh, I don’t know,” said the atheist. “How about how there is no God, or no Heaven or Hell, or no life after death?” as he smiled smugly. What jurisdiction should exclude Albert Einstein from questioning the religious practices of his very own tribe? Who has the monopoly on God? Who has the legitimate authority of restricting others from debating matters of faith? Anyone who lives has the authority to reflect upon life. Anyone who shall die has the authority to question after life? Anyone who loves should concern himself or herself with ethics. Anyone who thinks has the authority to query the concepts of God, Heaven or Hell. *Note for my non-Jewish readers; this story works equally well with a Priest a Rabbi and an Imam. I am, and have always been, deeply and religiously agnostic. Intolerant of any form of intolerance. The concepts of God(s) designed in man’s image or as heavenly avatars of a collection of natural phenomena or primitive existential angst, have always appeared to me as rather puerile and over simplistic superstitions. I fear that the question of God cannot and shall never be answered – neither by the eager “yes” of religious zealots nor the dismissive “no” of scientific clerics or crusading atheists. I personally subscribe modestly and indolently to an open-minded attitude of humility and impartial consideration. I recognize that the humanity of our most brilliant minds, to which I far from belong, will never pierce the deepest metaphysical and ontological mysteries of our souls, our hearts, our universe and our very own existence. I have to confess, I have no faith. I embrace fragility and evanescence. I am not prepared to battle on myths, presumptions, superstitions or hypotheses. Some do – fiercely – giving their lives, and more often than not, taking others. I don’t own the truth. I believe that the most important human endeavor is Love. Love for others. Love as the source of beauty, meaning, truth, intelligence, legitimacy, ethical conduct and dignity. Love as the source of our very humanity. Love as a principle guiding the morality of our actions in a world without certitudes and transcendental authority – a world without God, or perhaps worse, a world of far too many. This entry was posted in Israel / Judaism, Religion and tagged Albert Einstein, bovine scatology, Einstein, humor, humour, joke, Judaism, Michel Botman, Michel Botman Photography, Religion, religious joke. Bookmark the permalink.